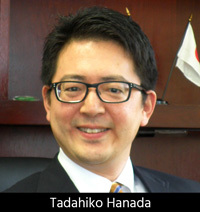 Taiyo America, Inc. announced that the company has promoted Tadahiko Hanada to Director & COO, effective July 1, 2015. Mr. Hanada earned a B.S. degree in physics from Kyoto University in Japan and started his career as a researcher of fiber optic devices at NEC Corporation in 1991. Since then he has contributed to broad areas including R&D, Product Development, Design, Product Release, Marketing, Sales, Product Strategy, Product Planning for Telecommunications, Data Communication, Mobile Phones, as well as the Cloud Service industry. Mr. Hanada joined TAIYO INK MFG. CO., LTD. in January 2014 as General Manager leading the IC Packaging Material business. “Tadahiko Hanada is a great endowment to Taiyo America and I look forward to his valuable management of the Carson City facility”, said Kashima, Taiyo America’s President. © 2019 Taiyo America, Inc., All Rights Reserved. TAIYO AMERICA, INC.is a manufacturing subsidiary of Taiyo Holdings Co., Ltd. which celebrated its 64th anniversary in September 2017. We are the worldwide solder mask market leader. For over 27 years, Taiyo has been exceeding the industry's needs for solder mask and specialty inks. Taiyo's products have a reputation worldwide for proven performance, outstanding quality and extensive end-user acceptance.